Controls: Volume, squelch, RF gain control. Switch Functions: S/RF/CAL/SWR, CB/PA, Memory/Scan, 9/19/Norm, ANL on/off, NB on/off, AM/USB/LSB, Talkback, Hi/Low mic gain, Weather, Day/Night dimmer. 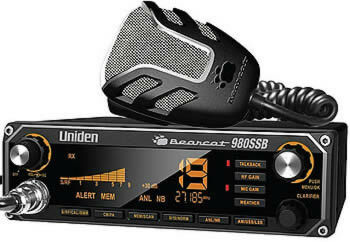 Dimensions: W 7.25" x D 7.5" x T 2.25"
The Uniden Bearcat 980 mobile SSB/CB radio brings an exciting new radio to the CB world. Featuring the same bells and whistles as the popular 880, the 980 adds Single Side Band capability and a SSB clarifier. Looking more like an in-dash CD player, the Uniden Bearcat 980 mobile SSB/CB radio has a large display with seven different color options. This radio includes 7 NOAA weather channels, a digital SWR meter, radio diagnostics, channel memory, PA capability, a dimmer switch and much more. The included six-pin microphone will fit comfortably in your hand, and the extra long mic cord allows you to talk from anywhere in your cab. Perfect for serious CB users and night drivers. For maximum performance consider the Astatic Road Devil mic. This option increases the output loudness considerably.